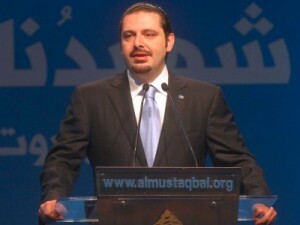 Lebanese Prime Minister Saad Hariri was reelected on Sunday as the head of the Future Movement. Future Movement parliamentary bloc leader and former PM Fouad Siniora declared the victory of Hariri at the Future Movement founding conference that was held at Biel Exhibition Center in downtown Beirut. During the conference the party also elected an 18-member political bureau. MP Samir Jisr won uncontested the post of Chairman of Future Movement’s Supervisory and Control Board. The newly elected Al-Mustaqbal politburo also appointed Ahmed Hariri as Secretary-General of the Future Movement. Also elected as vice-presidents were Bassem al-Sabaa, Antoine Andraous, and Samir Doumit. The Conference was attended by 600 Mustaqbal affiliates in their capacity as active members. Also participating at the conference were about 100 observers. Hariri said that the case of the assassination of his father has become a national, Arab, and international cause, adding that achieving justice “is not open for negotiation”. He added: “We are dealing with STL with a sense of responsibility to prevent strife from penetrating into our internal unity ” .